A 3D ventral view of Protasterina flexuosa. Biologists from Yale University have found an ancient fossil relative of sea urchins and starfish that displays a markedly different water vascular system — used for feeding and movement — compared to its modern counterparts. The fossil, a specimen of Protasterina flexuosa, is a brittle star that is some 450 million years old. Brittle stars, sea stars, and sea urchins all have an internal system of fluid-filled canals connected to an external system of tube feet. This water vascular system is a unique feature that distinguishes these animals, called echinoderms, from all other animals. “This fossil brittle star is remarkable as one of a very few to preserve direct evidence of the soft tissues of the canals and tube feet. 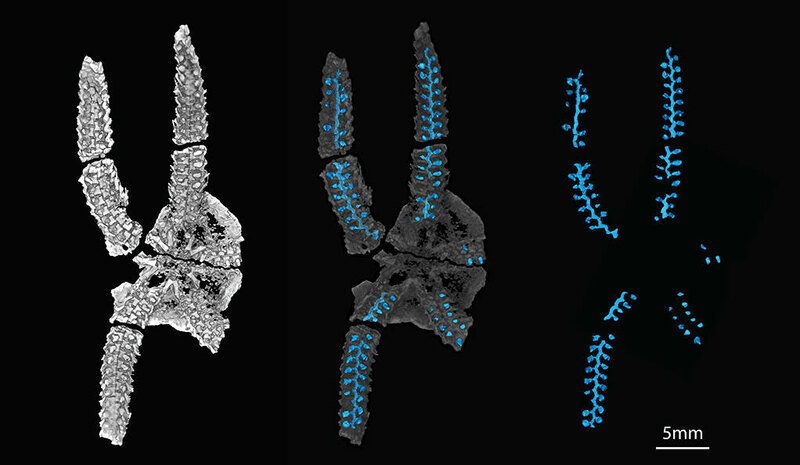 However, we found no evidence in the fossil of specialized muscles along the canals used by modern brittle stars to regulate pressure in their tube feet,” said Elizabeth Clark, a Yale graduate student in paleobiology and first author of a study in the Royal Society journal Biology Letters. “Our results suggest that these specialized muscles might have evolved after the evolution of symmetrical paired tube feet along the length of the arm,” Clark said. Co-authors of the study are Bhart-Anjan Bhullar and Derek Briggs of Yale and Simon Darroch of Vanderbilt University. Be the first to comment on "Ancient Fossil Reveals New Details About How Brittle Stars Functioned"